Arsenal defeated West Ham 3-0 to keep their Champions League hopes alive. The home side could easily have been awarded a penalty in the first-half. Theo Walcott was shoved to the ground by Arthur Masuaku, but the referee opted against pointing to the spot. Click here to see the incident – was it a penalty? Arsenal did finally take the lead through Mesut Ozil. Ozil fired the ball through a sea of West Ham defenders and his effort bounce awkwardly in front of, and past, Darren Randolph. The Hammers stopper will not want to see this one again. 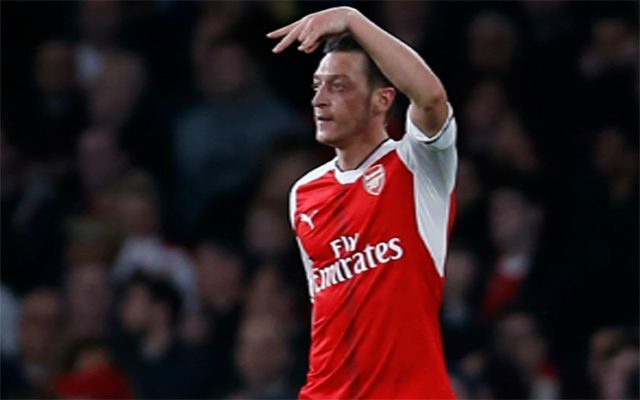 If you missed Ozil’s goal, you can see it by clicking here. Ozil then turned provider. His low delivery from the left-hand-side was met by Theo Walcott, who did what he does best and found the bottom corner of Randolph’s net. Click here to see the goal that sealed Arsenal’s victory. Olivier Giroud rounded off the victory with an absolutely stunning finish. Alexis Sanchez teed up Giroud on the right-hand-side of the penalty area. The Frenchman opened up his body and curled the ball into the top corner. What a goal it was, you can see it here.